Every few years I get in the mood to tackle something else from the massive Megami Tensei line of titles, and that synced conveniently with the release of Shin Megami Tensei: Strange Journey Redux. The word from this game’s original edition warned that it would be a considerable timesink, and that is most definitely still the case. Strange Journey in its Redux form actually manages to be even more of a timesink due to the addition of a mammoth new dungeon to explore, but at least this is not a complete waste of the many hours required to persevere. My urge to play anything else in the series has been successfully quashed for another year or two. A baffling phenomenon in Antarctica called the Schwarzwelt has aroused the intense interest of decision-makers around the world. This phenomenon is slowly expanding from the South Pole and placing all land inside within a black border that is impenetrable to all scanning efforts. No drones sent into the Schwarzwelt have survived to return, and the images they managed to broadcast before contact was lost only produce more questions instead of answers. Four ships crewed with the most talented people possible are about to set out into the Schwarzwelt, in order to hopefully learn what is happening. Upon entering the area matters within quickly diverge from what was planned, and an already-dangerous mission sees its odds of success decrease further. The player takes the on role of a soldier recruited in the event that combat prowess is needed inside, something that quickly proves to be a helpful skill set to aid survival once the demons inside the Schwarzwelt appear. 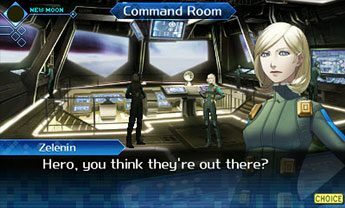 Strange Journey Redux has an enormously ambitious narrative that attempts to detail a series of events through which a demonic takeover of the Earth could occur, while avoiding any obvious insertions of unbelievable methods to advance the plot. It has a fairly large cast of characters with some depth to their motivations. The personalities at play are not as complex as they could be, since certain key players are locked into paths regardless of what the player might choose. Such ambition is worthy of praise even when not everything the narrative attempts is a success, and Atlus USA’s typically strong localization ensures that what transpires remains gripping. This is an involving tale that manages to keep coming up with interesting developments throughout, and avoids treating the player like a dullard when doing so. Having three potential endings in the original game along with new material including additional endings for the Redux version ensures that plenty of time can be spent with this setting if desired. Please be more specific. Who are they? If I knew, maybe it would mean something. Efforts to give the player input into morality are where the narrative does not come off best, primarily thanks to the limited options available. Three morality tracks provide the options for responses in numerous scenarios, but often none of the available responses convey what the player would prefer to do. These segments definitely offer more shades of gray and realistic portrayals of humanity than will be found in most RPGs, but not nearly enough to represent the gamut of possibilities found in the real world. Armed with a specialized suit that allows him to manipulate his surroundings, the protagonist wanders the multiple dungeons of Strange Journey while encountering plentiful demons along the way. In the vein of many other titles in this series, conversation with just about all battle participants is possible and often encouraged. Demons come with a sizable variety of personality traits, from old fogeys to creatures incapable of uttering more than guttural grunts. Conversation will frequently net rewards, and many demons are perfectly willing to join the player’s stable of party members if the right incentives are submitted. The chance also exists that the player will manage to infuriate instead of ingratiate, but the plentiful options for talking things through are both interesting and worthwhile. Many demons cannot be convinced to join the player and must be created through fusion. All defeated bosses and numerous scarce beings not regularly encountered can be created via the combination of demons extant in the current stock, which is an absorbing process that will divert a substantial amount of time. As in other games from the series, what can be created is strictly limited by the protagonist’s current level, which at least provides an excellent reason to seek out additional combat. 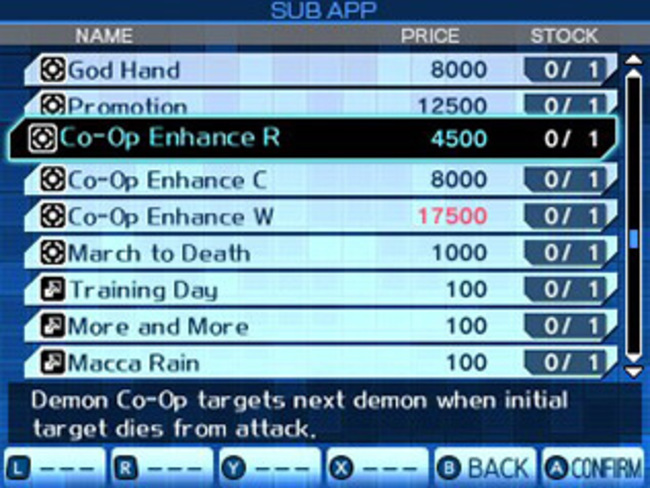 Fused demons can also inherit certain valuable abilities from previously-acquired party members, giving more incentives to spend time with this system. 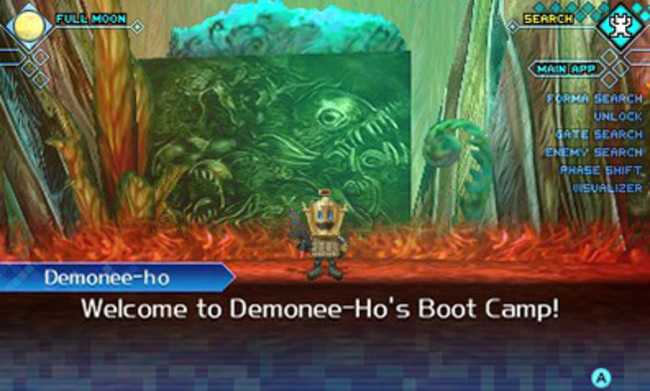 Demonee-Ho will treat you like dirt, and you will like it, soldier! Combat itself is a relatively straightforward turn-based affair in which the player and up to three companion demons duke it out against adversaries. Due to the presence of various elemental affinities and weaknesses, there is no such thing as a character optimal for every situation. Some enemies absorb or reflect attacks of specific types, and status ailments work regularly if the recipient is not immune. An important battle component is the automatic supporting attacks unleashed when an enemy’s weakness is hit, something that is most helpful against defensively-powerful opponents. Bosses require attention to be paid, as some of their abilities can destroy an unsuspecting player on even the lowest difficulty. Navigation of the dungeons is often no less a task than prevailing in altercations, as these are sizable places with many devious tricks to tax the player. One-way doors and poisonous floor tiles are just the beginning — soon enough other nasty elements such as holes in the ground and teleporter mazes add to the bedlam. Patience and the presence of an automap on the lower screen aid in unraveling these tricky places, which are addictive to explore even as they befuddle. Strange Journey oddly locks off certain parts of dungeons until New Game Plus mode is achieved, and it is bothersome to see such locations appear on the map without any way to explore them, especially when the game already requires around eighty hours to complete. That time can be lowered a bit by attempting to plow through the game without stopping to look around, but a great number of optional missions that usually ask for thorough navigation of the dungeons also exist to contribute still more content. Redux adds a number of options to the mix, starting with the ability to choose a difficulty upon beginning the game. Casual challenge is not a cakewalk but does make things more manageable. The major addition to Redux is a new character’s appearance in the second dungeon which opens the Womb of Grief, a completely new area which itself takes at least twenty hours to explore. Going through the Womb of Grief is optional but yields extremely helpful abilities that can tailor random encounter rates to the player’s liking and make dungeon navigation much easier. Among the very helpful things to be gained in the Womb of Grief is a function that shows where a teleporter will take the party, something that otherwise is dependent entirely upon memory. Unless one waits until near the end of the game, it is impossible to explore the Womb of Grief in one trek, since its lower portions can only be unlocked once various abilities to open multiple types of sealed areas in the main storyline are achieved. Each new floor represents a completely different undertaking and exploring the place is a worthwhile endeavor. Going through it also broadens the game’s conclusion options. Want to make your life easier? Get these and turn them on. Inventory arrangement is not one of this game’s strong suits due to the sheer amount of time it can take. Each specific item has an individual maximum amount that can be in the player’s possession, which at least eliminates the need to constantly return to home base in order to dump surplus supplies. Most new creations of the home base crew available for purchase require very distinct components that enemies and environments won’t consistently produce, and this can lead to many occasions where a tempting thing is inaccessible until the player tediously acquires its constituent ingredients. Just sifting through the huge mass of acquired materials in order to sell what is unnecessary also takes a very long time when several hundred possibilities are present. In most other ways the interface is functional, but this tediousness is difficult to overlook. Strange Journey Redux betrays its DS origins through the visuals that mostly date from its original iteration, though the result is not so much unpleasant as unremarkable. Dungeon layouts make the various areas distinct from each other but also have these places look pretty much the same within each location. An impressive variety of demon images will be found within, but they don’t move much and numerous designs will have been seen before in other Megami Tensei titles. First-person dungeon exploration rarely attracts much attention through its astounding good looks, and Strange Journey Redux does not break this trend. There are a few cinematic sequences which look nice but take up a very small portion of the time spent playing. Redux adds voiced dialogue to all the plot developments, something that can help give a little more character to the personalities. Its Japanese cast is workmanlike throughout but does not achieve such a stellar quality of performance as to entice all players to listen, especially when numerous demons have short vocal clips that will be heard many times during the proceedings. The music has some good compositions but really needed more variety, especially in its dungeon themes. Too many areas use male choral effects that sound similar, and later areas get reused compositions from earlier. Certain tracks are indeed very pleasant to the ear, particularly those heard when confronting bosses, but they aren’t heard often enough. I enjoyed my time with Strange Journey Redux, and the many things its dungeons offered will stick with me. Its narrative is also interesting and should be applauded for what it attempts, even if the story’s reach is not quite what it can attain. I was also ready to be done by the time the credits rolled and uninterested in starting the whole thing again to see another ending or reach the heretofore-forbidden areas, which keeps Redux from being among the crowning achievements in my RPG experience. It was a worthwhile title to encounter though, and should at least be tried by anyone curious. I’m not sure when I’ll be playing this, seeing as I hadn’t even gotten around to getting the other endings in the original DS release. Still, I think I will enjoy taking this strange journey again. Thanks for this, Mike. After 150ish hours of Backtrack listened to in 2018, hear your voice reading this in my head (is that weird?). Looks like a pretty decent time sink ahead for me once I clear a few others from the backlog!